When high tech and high touch are used effectively, you’re able to create a winning combo in the sales process. However, most people replace high touch with high tech instead of incorporating the two. This approach is likely costing them business. Are you losing customers due to your high tech approach? When technology is used as a replacement for making authentic connections with our prospects/clients, we’re opening ourselves up to our competitors. If your competitive advantage is built solely on technology, something bigger, faster and better is right around the corner. You just may find yourself scrambling to keep up and retain clients. My approach to selling has always been that the relationship takes priority over the sale. This fundamental belief has served me well over the years. 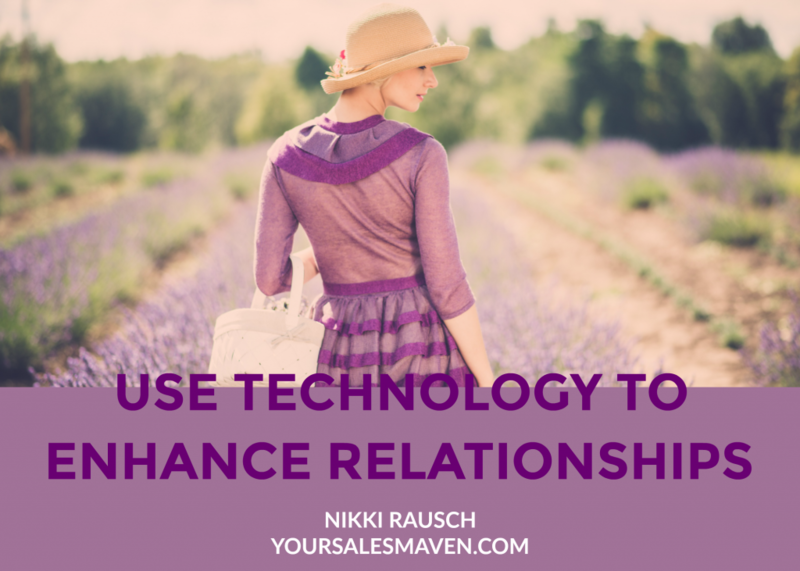 Technology should be used to enhance the relationship, not replace it. Example 1: Using scheduling software to book appointments. Many people use scheduling software so prospects/clients are able to book their own appointments. I love this high tech approach. However, be cautious with the way you position it to your client. Your messaging should position it as a benefit to make it easier for the client. Too many people send out scheduling software links with messages that give the impression you’re “so busy” you don’t even have time to build rapport. Look at your messaging and make sure the tone of the message is friendly, approachable and gracious. Example 2: Issuing invitations to groups/events. It’s so great how easy social media makes it for people to connect. Groups are a great way to build a community of like-minded people. However, since it’s so easy to add people into groups, many people are adding people without their permission. Using this great high tech approach without using high touch is such a turnoff. One of the best ways to add someone to your group is to send a private message and invite them to join your group. Leave it up to them to decide if they want to be included. If not, never add someone without their permission. If you’re doing this now, I promise you, people are making decisions to never buy from you. Example 3: Broadcasting messages to a large group of people. Oh, the wonder of group text messaging and Facebook messenger, such valuable tools. The high touch approach to using these tools means you cut and paste your message out to people individually with minimal work on your part. Yes, I know you can send one broadcast message out to everyone and it’s even faster for you. However, in the sales process, this is a mistake. Nothing turns people off faster than having to read 20, 50, or even a 100 “thanks” replies from people they have no interest in being connected too. You might be thinking to yourself, “People who don’t want to see those messages can easily remove themselves.” Well, they shouldn’t have to spend time removing themselves from your broadcast messages. This is a big-time rapport breaker. And for text messaging specifically, often people are unable to remove themselves from these types of messages. They have to suffer through them all. How Is This Going To Be Perceived? Before using a high tech approach to engage with your prospects/clients, ask yourself, “How is this going to be received by the other person?” If you’re doing something because it’s more convenient for you, you may need to add some type of high touch as well. Do your best to personalize the message whenever possible. Remember, you’re selling to a person, treat them as such. Prospects/clients don’t want to feel like a dollar sign or an afterthought.